Since 2001, MouCo Cheese Company has created award-winning artisanal soft-ripened cheeses with local cow's milk in northern Colorado. They pick up the milk from a local farm with their own little milk truck and produce bloomy-rind and washed-rind soft rounds of Camembert and Brie-style cheeses a few times a week. State-of-the-art equipment is met with great in-house cheesemaking art and science to create five different types of soft-ripened cheeses. All are ripened in-house and wrapped in special foil to allow the cheese to age properly and protect its integrity over the course of its 8-12 week shelf life. While very popular in Colorado, their cheeses are available all over the U.S. in fine restaurants, specialty stores, and grocery markets. MouCo Cheese Company has been recognized many times for their achievements with awards, television exposure, and articles in local newspapers and nationwide food magazines. Robert started out playing with Legos in Boulder, where he also went to elementary school and was taught math by the famous Charlie Papazian. His first experience with fermenting was going to Charlie's house, by public bus, to see his bathtub beer project. Charlie was so proud when he discovered he could make better beer by covering the cast iron tub with plastic wrap during fermentation. From there, he thought he was going to be Eddie Van Halen for a few years. Then he discovered snowboarding, and there went a few years. He finally landed a job at an industrial French bakery. This re-sparked his interest in fermentation, which ended up leading him into home brewing. The years continued to tick by while winning homebrew competitions. This led to the next job at New Belgium Brewing in Fort Collins, Colorado. After nearly 10 years fermenting beer, it was time for a change...soft ripened cheese here he comes! With his wife's father - a 40-year master cheesemaker from Germany - as his tutor to round out his fermentation in dairy, Robert and his wife Birgit started MouCo Cheese Company. The rest is history. MouCo Camembert is the first cheese MouCo started producing, crafted with the knowledge and expertise that only 45 years of family experience can bring to this delectable cheese. One taste and you'll know exactly what they mean! The cheese goes through a growing phase much like children, you can see them mature over time, and the proof is in the result. 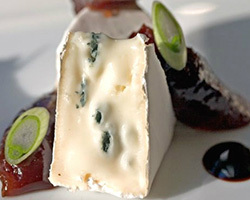 When young and in the first few weeks, the Camembert will have a firm, creamy texture with more than a hint of tartness. As it ages into its teenage years, the cheese develops a full-flavored nutty taste, like teenagers, slightly nutty. In its most mature stage, our Camembert develops a buttery richness and is a little soft around the middle with a strong, smooth flavor that's perfect when paired with fine crackers and a little bit of fruit. 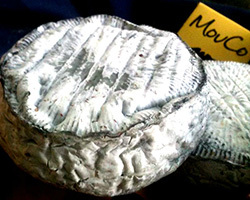 MouCo Camembert is made using cow's milk sourced from their local area. Their cheesemaking values dictate that there will never be any artificial colors, additives, or preservatives in their cheese to ensure it is the best our region offers. Lastly, each cheese is marked with a date code. Use it to enjoy the cheese to your liking: firm, a little soft, or soft and gooey. Make it your own! MouCo ColoRouge is a natural rind cheese that is reddish-orange in color with a slight white finish. Starting with the freshest pasteurized whole milk from a local Front Range dairy farm, MouCo spends the day turning the milk into fragile cheese curds, batch by batch. Each batch of cheese curds is transferred into molds that give the cheese its round shape and form. The following day, the cheese is transferred to one of the aging rooms. 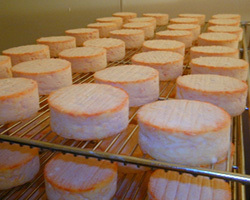 During the two-week aging period, the cheese is turned and "smeared" by hand. Smearing is a process by which each cheese has a culture applied to the surface. This culture both develops the glowing orange rind as well as gives it its unique flavor and aroma characteristics. Like jazz, the flavor changes as it ages - soft and creamy with mild buttery overtones give way to a complex odoriferous nature. Keeping in the tradition with all of their cheeses, MouCo Ashley begins its life with only the freshest pasteurized whole milk we can find on the Front Range. This silky, smooth cheese is soft and mildly sweet, delighting your taste buds with a surprising combination of tartness and ooey-gooey deliciousness. We'd also like to think it speaks to your soul with verve and aplomb, but we'll leave that for you to decide. As a finished product, Ashley draws its name from being covered in a fine layer of vegetable ash. Don't worry, it's edible! And oh-so good, too. When young, Ashley is buzzing with tartness and has a light, stiff center while still aging. While ripening, a sweetness creeps in to compliment the tartness, while the pate becomes creamier in flavor and texture. 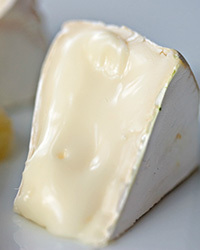 Ashley is of age at 7 to 8 weeks, ripe, gooey and soft, while a definitive line indicates the edible rind. Complex with a hint of sweetness, the cheese hums with flavor and soul. MouCo's PepBert is a twist on an old classic. 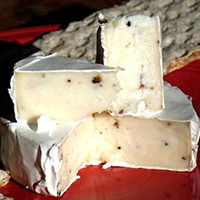 They've taken their flagship cheese, the Camembert, and added a generous helping of whole, green peppercorns to the mix. The results are unexpected, exciting, delicious. The cheesemaking process softens the peppercorns, many of which are to be found in each bite. "Spicy" might be an overstatement, but not a big one. The peppers add a complexity to the cheese not otherwise found. It's perfect on a cracker all by itself, but especially wonderful melted atop a burger or sprinkled in a mixed-green salad. Perfect for cheese lovers, of course, but pepper lovers will find much to love here as well. As PepBert ages, the character complicates and matures. The spiciness of the peppers gives way to some of the Camembert's natural tanginess, and the two notes work in harmony together.